How Do Americans Feel About The NFL Protests? It Depends On How You Ask. Vice President Mike Pence during the national anthem before a game between the Indianapolis Colts and the San Francisco 49ers on Sunday in Indianapolis. The debate over NFL player protests was reignited on Sunday when Vice President Mike Pence left an Indianapolis Colts game early after a number of players on the visiting San Francisco 49ers kneeled during the national anthem. (At least one player on the team has kneeled during the anthem every week this season.) President Trump said Pence left at his request. Polls about the protests have shown wildly different, seemingly conflicting results about where the public stands. But the polling results aren’t as conflicting as they seem, and what pollsters find is heavily influenced by what the debating parties believe the protests mean. Patriotism. Trump said his objections to the protests were about “respect for our Country, Flag and National Anthem,” not about race. Free speech. Some onlookers have defended the protests as a matter of free speech, regardless of what issues that speech is meant to highlight. Race. When Colin Kaepernick first began protesting during the national anthem a little over a year ago, he said he wasn’t going to show pride in a country that oppresses people of color, citing a litany of police violence against black Americans. These three ways of looking at the protests have colored the polling. A recent CBS/YouGov poll of over 1,300 respondents asked people — regardless of whether they agreed with the protests — what NFL players were trying to do by kneeling during the national anthem. A large majority (73 percent) of respondents said the players were trying to call attention to racism, and 69 percent said players were calling attention to police violence. But 40 percent said the protests were trying to disrespect the flag, while 33 percent said the goal was to disrespect the military. As might be expected, answers to that question, and to nearly all poll questions related to the NFL protests, are highly polarized by race and party. There are stark differences, for example, between what black and white Americans say is the protests’ purpose. Among white respondents, 50 percent said players were trying to disrespect the flag. Only 11 percent of black respondents said the same. A strong majority (88 percent) of black respondents said the players were trying to call attention to unfair policing, while 67 percent of white respondents believed this was the case. Let’s start with polls that don’t mention why NFL players are protesting and just tell respondents that players are kneeling during the national anthem in protest. These surveys tend to find that more people disapprove of the protests than approve. According to the CBS poll, a little over half of respondents disapproved of players kneeling during the anthem, while 38 percent approved. Similarly, in a HuffPost/YouGov poll, close to half of respondents felt the protest was inappropriate, while 36 percent thought it was appropriate. In a separate CNN poll, when asked whether players kneeling during the anthem is the right or wrong thing, 43 percent of respondents said players were doing the right thing while 49 percent disagreed. 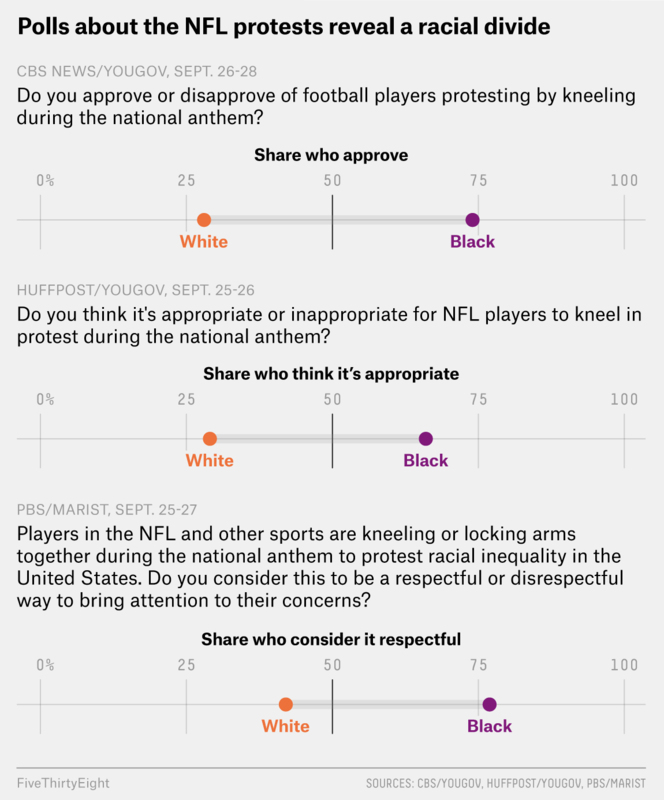 It depends somewhat on how you ask, but it turns out that despite the general resistance to the protests, a majority of Americans think players should be allowed to kneel — whether the respondents like it or not. At the least, a majority of those polled don’t think NFL players should be fired for kneeling. The HuffPost/YouGov found that only 30 percent of people supported firing players who protested, and a Cato Institute survey found 38 percent support for that position, with 61 percent opposed to firing players. Moreover, most people don’t like Trump’s response to the protests, in which he said NFL team owners should fire players who kneel. This issue, of course, touches on a foundational principle of American democracy: freedom of expression. And Pew Research Center conducted a poll in February that, without mentioning the NFL protests, found that 79 percent of Americans felt that the right to conduct nonviolent protests was essential for an effective democracy and 74 percent believed in protecting the rights of those with unpopular views. So Americans support free spech. At least in the abstract. Fifty-two percent of adults in a Marist poll and 58 percent of respondents in an Ipsos poll said professional athletes should have to stand during the anthem. We’re left with a somewhat conflicted picture, but it seems that while most people think players should have to stand during the anthem, they don’t want to see players fired for failing to do so. It’s not clear if pollsters would find more support for the NFL protests if polls explained what players are protesting. A PBS NewsHour/Marist poll asked respondents if they found it respectful or disrespectful for players to kneel or lock arms during the national anthem to protest racial inequality in the U.S. The results were still divided, with 48 percent of respondents saying it was respectful and 46 percent disrespectful. A Quinnipiac Poll conducted last October — before Trump got involved in the issue — asked respondents if they approved of athletes’ sitting during the national anthem in protest of police violence against the black community. In that case, 54 percent of respondents disapproved of the protests. But 72 percent of respondents in the same poll agreed that police brutality is a problem in the U.S. and a plurality (48 percent) believed that police nationwide are generally “tougher” on black Americans than white Americans. Other polls have found a similar split in public opinion on police violence. In 2015, an Associated Press/NORC poll found that 32 percent of Americans said police violence in the U.S. was an extremely or very serious problem, while 35 percent said it was moderately serious and 33 percent said it wasn’t too serious or not a problem at all. A PRRI poll the same year found that a little over half (52 percent) of Americans feel police treat black and white Americans differently and 49 percent of Americans said incidents like the one in Ferguson, Missouri, in which police killed a black man, are part of a broader pattern, while 39 percent felt they were isolated incidents. 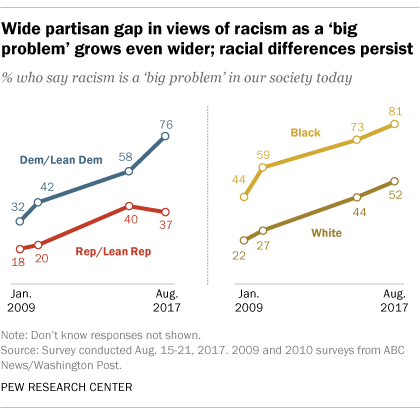 But if you zoom all the way out and ask whether racism is a problem generally, most Americans (58 percent) agree it’s a “big problem in our society,” according to a recent poll by Pew Research Center. That’s is up from 28 percent of Americans who viewed racism as a major problem in the U.S. in 2011. On the other hand, when polls focus specifically on the Black Lives Matter movement (which started in response to police violence against African-Americans), rather than the issue of racism in general, support plummets. In a YouGov poll about Kaepernick last year, only 27 percent of respondents said they supported the movement, while 44 percent were opposed. Among black respondents, 66 percent said they approved of the movement while 52 percent of white respondents did not, with 43 percent of white respondents strongly disapproving. So most people support NFL players kneeling when the issue is broadly defined, while simultaneously a plurality of people disapprove of Black Lives Matter. A plurality of Americans don’t like the NFL protests — at least if they aren’t told what the players’ goals are. But Americans generally dislike protests involving the flag or anthem, so it’s not clear how much that might affect public opinion in this case. Most Americans think racism is a problem in the abstract, but people are less likely to support the Black Lives Matters movement, which aims to stop police violence against African-Americans. Americans are broadly supportive of the importance of free speech in general, though opinions are more muddled when people are asked about kneeling during the anthem in particular. Opinions on the NFL protests change dramatically depending on which Americans are asked about them and whether the questions focus on patriotic symbols, race or free speech. But these partisan and racial divides are part of the bedrock on which this issue is playing out.